I prayed for some time to see what I should write about for the letter N. My head wanted to write about my mother Nancy - who is in heaven. I believe God has something else for this post though. If you know Jesus as your personal Savior then you know you are a new creature as 2 Corinthians 5:17. What a wonderful assurance God gives us in his word. We don't have to dwell on the past but can live in newness of today and tomorrow! This topic can be applied at Salvation but what about New Years? It is only a week past and the year is still very new... Why do we put so much emphasis on changing at the beginning of the year rather than the beginning of each day? I think that will be my personal prayer in the upcoming weeks - to treat each day with newness because Jesus granted us a new life. If you haven't accepted Jesus as your personal Savior I hope you will get that settled today! Click on the image above to see all the post included in this series! 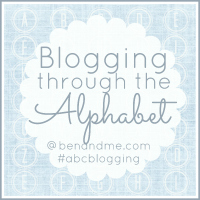 Saw your post through the Blogging Through the Alphabet link up. Such a good point about starting each day anew. A great habit to get our children into as well. God wipes our slate clean and His mercies are new every morning. The least we can do is thank Him and renew that commitment to follow each day. Thanks Tessa! I appreciate your comment!